Mahindra and Mahindra is currently one of the largest SUV maker in the car market, which has several models in its portfolio. 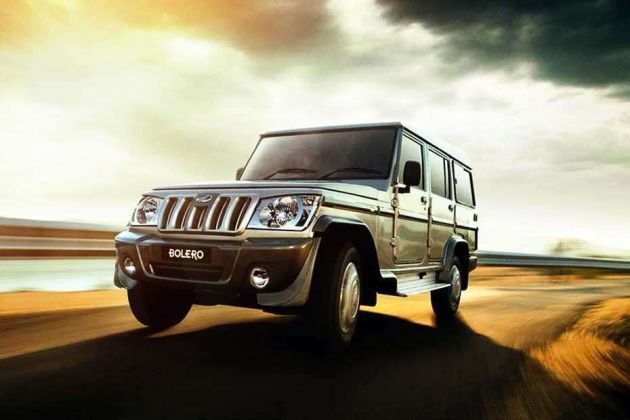 One of the prominent sports utility vehicle in its fleet is Mahindra Bolero, which is available in numerous trim levels with a diesel engine as standard. The Mahindra Bolero SLE is the mid range variant, powered by a 2.5-litre mill that complies with Bharat Stage IV emission norms. It has the ability to deliver an optimum power of 62.1bhp and develops 195Nm, which helps in producing a mileage of 15.96 Kmpl. This vehicle comes with contemporary interiors and masculine exteriors, which helps it to be more competitive in its class. To start with its appearance, this vehicle has signature radiator grille along with hawk-eye shaped headlight cluster and rugged bumper, which emphasizes its aggressive appeal. In terms of interiors, it comes with a dual tone beige color scheme, which is accentuated by metallic inserts. The manufacturer has bestowed this trim with quite a few comfort features including HVAC unit, vinyl/fabric upholstery and middle row center armrest. It is also integrated with first in class digital screen that displays several notifications and provides all the information related to vehicle speed, fuel levels and so on. The manufacturer is offering this vehicle with standard 1-year/unlimited kilometers, which can be extended further. This vehicle has a boxy body design with classy exterior features, which makes it a good looking vehicle. Despite of having few outdated aspects, it still looks attractive owing to its masculine features. On its front, this SUV has a large hawk-eye shaped headlight cluster that gives a dynamic appeal to it. In the center, it has a contemporary metallic radiator grille with honey-comb mesh inside . Below this, it comes fitted with a strong bumper integrated with a pair of round shaped fog lights along with an air intake console. Coming to the sides, it has a distinct look, thanks to the different design of doors. It has basic features like black colored door handles and manually adjustable outside mirrors. Furthermore, its wheel arches are fitted with body colored strips and are fitted with a set of 15-inch steel wheels. These rims are further equipped with full wheel covers and covered with terrain capable tubeless radial tyres of size 215/75 R15. The rear facet has a classy appearance owing to the large windscreen and retro-style strong bumper. Its taillight cluster is small, but it is equipped with high intensity third brake light along with turn indicators and courtesy lamps. Currently, this SUV comes in five exterior paint options including Java Brown, Fiery Black, Toreador Red, Rocky Beige and Diamond White. The interiors of this Mahindra Bolero SLE trim are done up in a classy dual tone beige color scheme, which is further amplified by metallic inserts. Its cockpit has a large dashboard, which is designed with a storage compartment and a central console with wood inserts. This central console has been integrated with a HVAC unit along with a gearbox console. The steering wheel along with the gear level have been decorated with metallic inserts while the door handles and glove box lid are in beige. It has a wide digital screen that plays the role of an instrument cluster, while providing crucial information to the driver. It has a large cabin space, which can provide seating for at least seven passengers. This vehicle comes with a large wheelbase of 2680mm along with a height of 1880mm, which is the reason for ample leg and head space inside. The front seats have door arm rests while the middle row seats have centrally mounted armrest, which is covered in vinyl upholstery. There are quite a few utility based aspects given inside like a storage unit, bottle holders in doors and remote fuel lid opening facility. This vehicle is powered by a 2.5-litre diesel engine that is incorporated with a common rail direct fuel injection system. This BSIV engine comes with 4-cylinders and 8-valves based on SOHC valve configuration. This allows the motor to pump out a maximum power of 62.1bhp at 3200rpm that helps in generating a commanding torque output of 195Nm in the range of 1400 to 2200rpm. The SUV maker has skilfully paired this motor with an advanced 5-speed manual gearbox that powers the front wheels. This vehicle has the capability to give away a minimum mileage of 12.4 Kmpl on city roads while delivering 15.96 Kmpl on highways. It takes about 25 seconds for this vehicle to break a 100 Kmph mark. On the other hand, it can reach a top speed of approximately 125 Kmph, which is rather decent. The company has equipped the front wheels with a set of disc brakes and paired the rear ones with drum brakes. This front axle is paired with independent strut along with coil springs and anti roll bars, while the rear axle has elliptical leaf springs, which keeps it well balanced. This vehicle is also integrated with an electric power assisted steering system with a turning radius of 5.8-meters, which simplifies handling of this vehicle. The Mahindra Bolero SLE is one of the mid level variants, which is equipped with a set of basic features. Its central console has been affixed with a proficient heating ventilation and AC unit along with air con vents, which keeps the ambiance cool. The dashboard also has a large glove box unit along with a storage tray in central console, which allows to store files and small things. All the seats have been integrated with head restraints, while the second row seats also have center armrest. In addition to these, it has aspects like remote fuel lid opener, digital display, inside rear view mirror, grab handle on dashboard, vinyl/fabric upholstery and power steering system. The car maker has built this vehicle using high strength steel and equipped with strong bumpers, which can divert kinetic energy caused in case of collision. Its insides have child locks along with head restraints, which provides safety to occupants. It also comes with an advanced engine immobilizer that has encrypted key recognition system, which protects the vehicle from unauthorized access. 1. Engine torque output and fuel efficiency is good. 2. Interior space and seating capacity is satisfying. 1. There is scope to improve interior design. 2. Poor safety and comfort features are a big minus.